Thanks for this post – just used it on a project at work and it was very helpful. 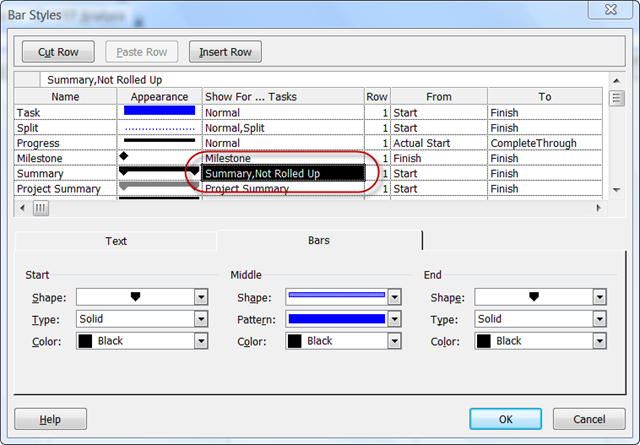 i did not understand the meaning of Roll ups, be it in Milestone or Gantt chart..whtever.kindly explain..
Rollups = rolling data from the milestone or task level to a summary task…or combining most of (or more of) the project data into a single row. Maybe you could be a bit more specific? Not sure I follow which option it is. There’s a Rollup button, but it really just sets the outline level. Is it possible to show links between rolled-up tasks (not so much between tasks of the same project, but between tasks of different projects) ? Nothing comes to mind, but I suppose it could be possible. I’m a fan of add ons like One Pager Pro for stuff like this. Thanks for this helpful article! I’m having trouble with having the formatting effect more than one rolled-up task bar. I’ve successfully formatted one roll-up, but the formatting specs are not carrying over to the second roll-up bar. I’m creating a master schedule that will show various projects using all the same flags/tasks/etc.. Is there an additional step to format more than one roll-up bar? You may have clicked on a single bar and formatted that. 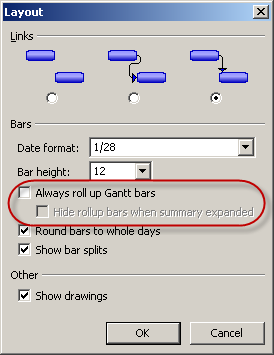 You need to click on the Gantt Chart (not on a bar), and make sure you’re formatting globally for all bars. Can you create more than 20 flags? You can with Project Server, but the Gantt won’t respect it. Note that will net you 2^20 permutations though….which should be enough. Can you roll up into a “Group” or only summary lines? I frequently group by a text field and I do not see a way to roll up into the top level group line. Pretty sure you can. As I recall, you need to modify the appropriate format for the Grouped By summary bars. 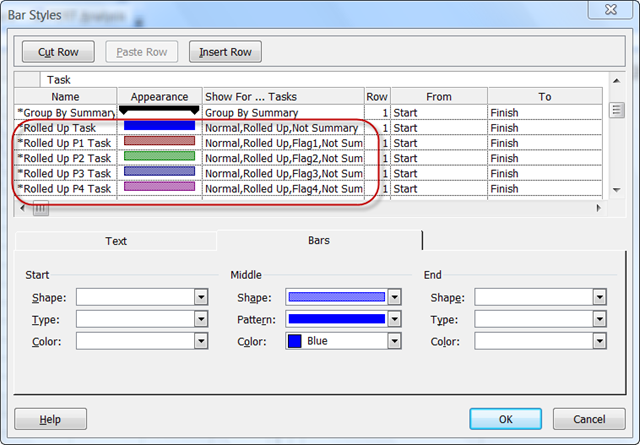 Hi, I am trying to get tasks to rollup onto “Group By Summary” lines too, like Laura’s original question, but it seems the Rollup field for Group By Summary lines cannot be changed from “No”… so unfortunately it seems it’s not possible… unless anyone has a workaround? 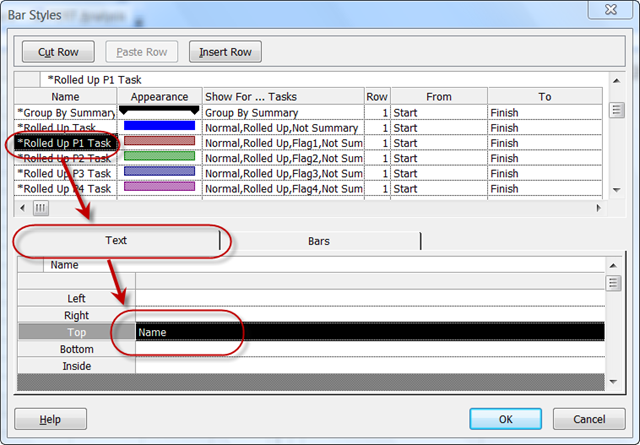 hi there – this article seems really useful for somerthing I am attempting to create in EPM2010. I have a system of hierarchical schedules (multiple project level schedules linking or embedding into Programme level schedules and, ultimately a view at portfolio level of main milestones which can be monitored and reported to seniors as a consolidated and relatively simple view. Will the work for Milestones only – ie. we have a summary bar for “Project X”, showing and labelling the main milestones from it at points along that bar. Presumably the principles above all apply? That might be a bit of a stretch for this. For what you’re trying to do, I would typically use the OnePagerPro add in from Chronicle Graphics. It basically does everything you’re looking for. Can we do Task Rollup using project server CSOM?